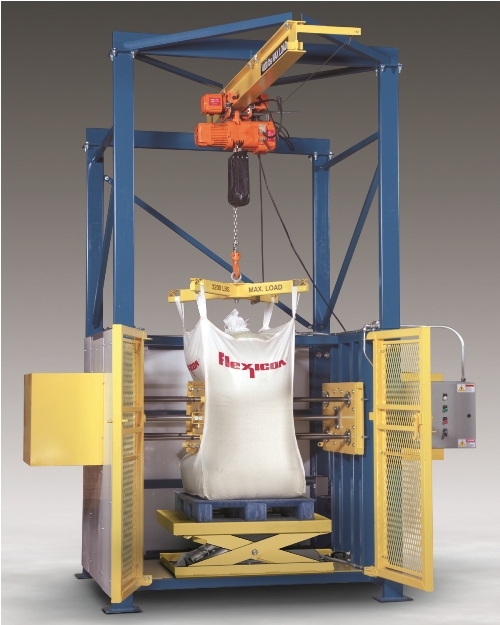 BETHLEHEM, PAA new BLOCK-BUSTER™ Bulk Bag Conditioner from Flexicon features a hydraulically-actuated, variable-height turntable for automated in-frame bag rotation and conditioning of bulk bags at varying heights. The number and pressure of hydraulic ram actuations, the height of the turntable, and the degree of rotation are user-programmable.Two hydraulic rams with specially contoured end plates, press opposing sides and corners of bulk bags, loosening material that has solidified during storage and shipment, enabling bulk bag unloaders to discharge it through bag spouts. A cantilevered I-beam with motorized hoist and trolley allows loading and unloading of bulk bags without the need for a forklift. The system controller and hydraulic pump can be mounted on the exterior of the safety cage or remotely. The conditioner is fully enclosed on all four sides for operator safety and includes full-height doors that are interlocked to disallow operation of the system when the doors are open. The conditioner is recommended for bulk bags containing hygroscopic chemicals, certain spice blends, heat-sensitive products, and other materials prone to solidifying to the point at which pneumatically-actuated flow promotion accessories integral to bulk bag dischargers are inefficient or completely ineffective. The conditioner is also offered without a variable-height turntable, in which case the bag is raised and lowered using the motorized hoist, and rotated manually, for conditioning of the bag at any height and any degree of rotation. The conditioner is offered as a stand-alone unit or integrated with the company’s BULK-OUT™ bulk bag discharging systems. Also manufactured by the company are mechanical conveyors, pneumatic conveying systems, bulk bag fillers, bag dump stations, drum/box/container dumpers, weigh batching and blending systems, and engineered plant-wide bulk handling systems with automated controls.